My mom's Homemade Lasagna, an easy lasagna recipe made in just 10 minutes hands on time for an easy weeknight dinner! 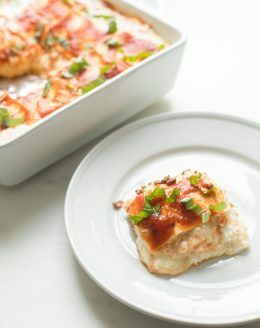 This lasagna with cottage cheese makes it so incredibly gooey, while also making it a filling dinner to feed a family or reheat throughout the week! Brown ground beef in a skillet over medium-high heat. Combine cottage cheese, mozzarella, minced garlic, basil or parsley and an egg. Line your dish with noodles. Cover with 1/2 of the ground beef and pour 1/4 of the spaghetti sauce on top. Add another layer of noodles and cover with half of the cheese mixture. Add another layer of noodles with remaining ground beef, 1/4 of the spaghetti sauce. Add another layer of noodles and cover with the remainder of cheese mixture. Top with noodles and sauce. Cover with foil and bake 25 minutes. Remove foil and bake 5 more minutes. Allow to set 5 minutes, top with fresh basil and serve. If you have a few extra minutes, fresh shred mozzarella for an extra creamy taste.